Ardbeg Uigeadail, a single malt whisky from Ardbeg Distillery on the remote Island of Islay has been awarded the top accolade, “World Whisky of the Year” 2009. This follows the success of the distillery’s flagship expression Ardbeg Ten Years Old which scooped the same honour in 2008. The award comes with the publication of the 6th annual edition of whisky authority and writer Jim Murray’s, “Whisky Bible”. A favourite with whisky aficionados, barmen and connoisseurs around the world Jim Murray has nosed and re- tasted a staggering 1500 whiskies to bring the guide which includes notes on a total of 3000 whiskies, right up to date. Ardbeg Uigeadail, bottled at a powerful 54.2% ABV, takes its name from the hill loch which supplies the peat-laden water to the distillery on Islay, and is famed for its deep, rich, smoky complexity. 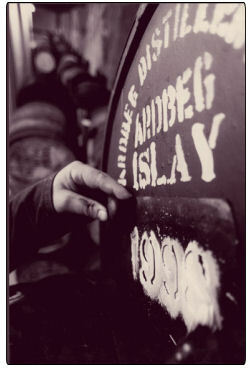 First introduced in 2003 Uigeadail (in Gaelic – “it means dark, mysterious place”) is a regular favourite amongst Islay whisky connoisseurs and the award will no doubt give Ardbeg a further boost in awareness as the distillery continues to win fans around the world for its uncompromisingly powerful, peaty, smoky expressions. During the 1980s and 1990s, Ardbeg suffered from an uncertain future and it was not until Ardbeg was purchased by Glenmorangie plc in 1997 that the distillery was saved from extinction. Since then, the distillery has risen like a phoenix and today Ardbeg is well established as a niche, cult malt, with a passionate following. Hamish Torrie, Ardbeg Brand Director says: “Jim’s accolade of identifying Uigeadail as the best whisky in the world delights all of us who work on Ardbeg. For Ardbeg to get “Top Dog” recognition for the second year in a row, after such a comprehensive look at all the new whiskies that have come out recently is some feat. It is a tribute to the consistency, dedication and sheer skill of the team at the distillery, and our Whisky creation team, led by Dr Bill Lumsden and Rachel Barrie. He continued, “What really pleases us about “winning the double” is that both are not rare, unattainable connoisseur whiskies costing hundreds of pounds: Ardbeg 10 years Old and Ardbeg Uigeadail are core to our range and widely available”. Your can read more information regarding Ardbeg Distillery at the Scottish Distillery reference on this site.